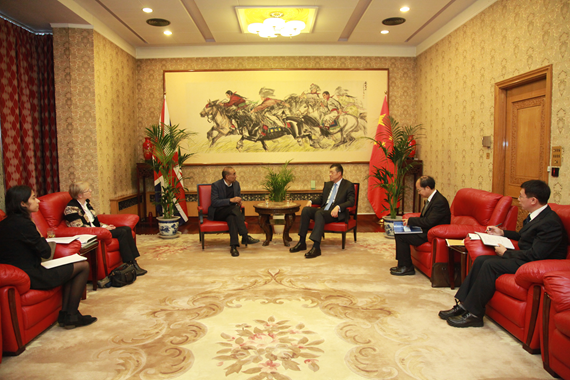 On 20 October 2016, Ambassador Liu Xiaoming met with Sir Venkatraman Ramakrishnan, President of the Royal Society, at the Chinese Embassy. Ambassador Liu said President Xi Jinping's state visit to the UK last year unveiled the "Golden Era" of China-UK relations. At present, the two countries are making continuous and steady progress in their bilateral ties. It is hoped that the cooperation between China and the UK in scientific and technological innovation could bear more "golden fruits" for the "Golden Era". Ambassador Liu welcomed Sir Venkatraman Ramakrishnan's forthcoming visit to China, which will be his first as President of the Royal Society, and wished his visit a complete success. Sir Venkatraman Ramakrishnan looked forward to visiting China. He gave his full endorsement to Ambassador Liu's view on further strengthening UK-China exchanges and cooperation in scientific and technological innovation. The Royal Society would continue playing a positive role, said Sir Venkatraman, so that the UK-China cooperation on scientific and technological innovation could continue to grow and reach a new level. The Ambassador and Sir Venkatraman exchanged views on enhancing China-UK cooperation in a wide range of fields, including the "Belt and Road" initiative, life sciences, aviation and aerospace, energy, science and technology policies and young scientists exchange.